Tooling Blocks simultaneously provide multiple faces to hold components accurately in vertical plane for machining on Horizontal machining centres. 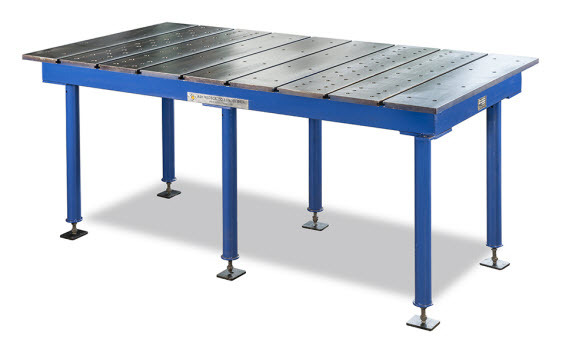 Upon indexing of table a new face with new components is obtained for machining resulting into significant reduction of downtime by elimination of multiple set ups. Pallet mounting tooling blocks also enable simultaneous loading and unloading of multiple fixture plates thereby reducing total set up time. Tooling Blocks can also be used for vertical clamping of components on Horizontal Boring Machines, Milling Machines, Horizontal Jig Mills etc. Made from stress relievd plain close grained gray cast iron conforming to Grade FG: 220 of IS: 210 (equivalent to GG25/F T25/ 35-A). Higher grades also offered on request. Machined / Hand scraped surface finish. M16 tapped holes / helicoil inserts, vertical tenon slots/edge locator tapped holes / coolent drain holes, can be offered upon request. Bottom base can be provided with counter bored holes for fixing / clamping on machine pallet, upon request. Working faces flat, Square and parallel within 25 microns (0.001") over 300mm (12"). Milled Tooling Blocks also offered with suitable allowance (extra metal) for final finish machining on user's own machining centres, on request. Special features, if required, can also be offered.